Many biological, geophysical and technological systems involve the transport of material over a network by bulk fluid flow (advection) and diffusion within that fluid. The analogy is that ink spilled in the middle of a river both spreads out symmetrically by diffusion (even if the river were stationary) and also gets transported bodily with the flow of the river (advection). Bulk fluid transport systems are found in the vast majority of multi-cellular organisms, as the component cells of such organisms require resources for metabolism and growth, and the speed of diffusion alone is often such that it is only an effective means of exchange at microscopic length scales. Molecules of interest are carried by advection and diffusion through the networks that make up fungi, the blood vessel networks of animals, the xylem and phloem elements of plants, and various body cavities of many different animals. Advection and diffusion are also fundamental to transport in geological and technological systems, such as rivers and drainage networks, gas pipelines, sewer systems and ventilation systems. In all of these cases the particles of interest diffuse within a moving fluid, which is constrained to flow within a given network. Furthermore, the molecules that are carried through the network may be consumed or delivered out of the network at a particular rate. For example, glucose molecules are carried through the blood, and at each point in the network there is some probability that a given glucose molecule will be transported out of the vascular system and into the surrounding tissue. We have recently developed an algorithm for predicting how the spatial distribution of nutrients in a network will vary over space and time, when the resource in question is subject to given rates of advection, diffusion and delivery. We explain the algorithm in our paper "Advection, diffusion, and delivery over a network" that recently appeared in Physical Review E.
(a) Phanerochaete velutina in a 24cm x 24cm microcosm, photographed just before radio-tracer was dripped onto the inoculum. (b) Data from the photon counting camera. The brightness of the image reflects the concentration of the tracer in each part of the network. (c) Digitized network, coloured to indicate the tracer concentration. Concentration is measured in arbitrary units, and edges that could not be measured are coloured black. (d) Predicted concentration measured in arbitrary units, under the assumption that the tracer enters the network at the inoculum at a constant rate, each edge in the final network continues to grow (or shrink) at the same rate that was observed over the final time step, and 10% of each edge is occupied by transport vessels. (e) Predicted intensity in arbitrary units under the same assumptions as diagram d), except that in this case we assume that 20% of each edge is occupied by transport vessels. 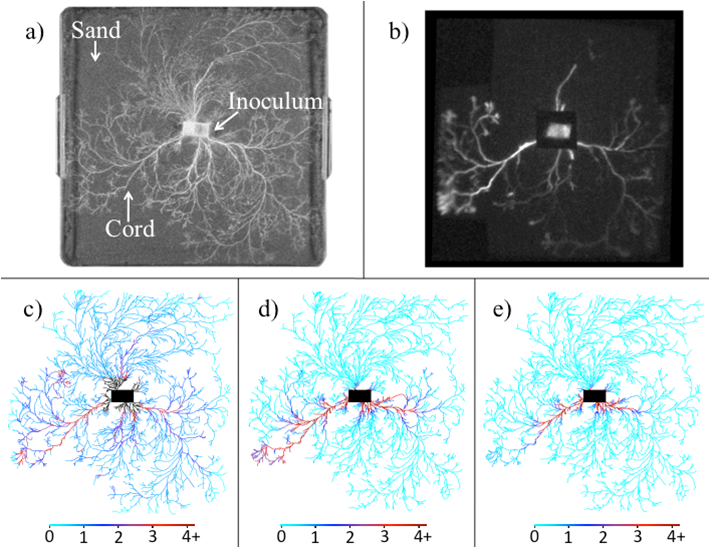 We are particularly interested in modeling the movement of radio-labelled tracers in growing fungal networks. As mentioned in a previous post, we hypothesize that within fungal networks, there is a bulk movement of fluid from the sites of water uptake to the sites of growth. To test this hypothesis, we allowed the fungi Phanerochaete velutina to grow on a dish for a four week period, taking photographs every three days. An image analysis program was then used to convert the sequence of photographs into a sequence of networks, comprised of edges of measured length and volume.